Nowruz, Persian New Year, literally meaning "new day", begins on the first day of spring, the season of rebirth. It is the time for new beginnings, and so, what better time to build a new friendship with other fellow food-bloggers in our Iranian community across the world. Along with 13 other very talented food-bloggers, cookbook authors, and chefs we are publishing our Nowruz recipes in a recipe round-up today on our blogs. I just can't wait to try the amazing recipes all these ladies have published today. For a list of participating bloggers and their Nowruz recipes refer to the bottom of this post. For my blog, I decided to stay true to my Mazandarani roots and make northern-Iranian style herb stuffed fish. The abundance of herbs, pomegranate paste, and garlic makes this dish uniquely northern Iranian. And the Fish itself is the one ingredient that must be present on the Persian New Year table. As we're getting closer to another new year, I wish you all peace, happiness, and love. *The original recipe calls for herbs (such as ouji, zolang, anarije, sorsom) indigenous to northern Iran, since these herbs are not even common in the rest of Iran, I wasn't able to find a correct translation of their English name. You can use the herbs I have listed in the recipe, the result is equally delicious. **We are fortunate enough to have our pomegranate paste shipped to us by my lovely aunt from Iran. These pomegranate pastes are much thicker than the ones you'd find in the specialty supermarkets in the US, so you might have to use more pomegranate paste than noted here if you're using store-bought kind. But then that might make your stuffing too watery (you'd want a paste like consistency), so keep that in mind and tweak the recipe to get the right balance of flavor and consistency. Clean and gut fish, scale and remove gills. Preheat oven at 350 degrees, and lightly oil a baking dish. Heat the oil in a saute pan over medium heat and brown the onions, about 10 minutes. Add the minced garlic and saute for an extra minute. Add the chopped herbs and cook for 3 to 5 minutes until the liquids evaporate. Mix in the barberries, 2 tablespoons of lemon juice, pomegranate paste, and ground walnuts. Cook for 2 more minutes, season with salt and pepper, then remove from heat. Season the the fish, and stuff with the herb mixture. Pin or sew the cavity shut. Cut small slits on the fish and let it bake in the oven for 25 to 30 minutes until golden. Transfer fish to a serving platter. Melt butter and mix with liquid saffron and remaining lemon juice and spoon over fish. Garnish with fresh herbs and Seville orange or lemon wedges. دیگه چیزی به نوروز نمونده و چه وقتی بهتر از نوروز برای پیدا کردن دوستهای جدید. امسال همراه با ١٣ بلاگر هنرمند دیگر در سراسر دنیا پستهای نوروز رو همزمان منتشر میکنیم. فقط نمیتونم صبر کنم تا دستورهای این خانم های هنرمند رو امتحان کنم. برای دیدن لیست این بلاگ ها و دستورهاشون به لیست بالا رجوع کنید. من برای کافه لیلی تصمیم گرفتم که به اصلیت شمالیم برگردم و دستور خانوادگیمون برای ماهی شکم پر رو پست کنم. توی این سال جدید برای همه شما دوستان وفادار آرزوی صلح, شادی, و عشق میکنم. برای این ماهی شکم پر معمولا از سبزیهای معطر شمالی مثل زولنگ, اناریجه, و سوسنبر همراه سبزیهای دیگر که لیست کردم استفاده میکنیم. در صورت دسترسی نداشتن به این سبزی های بومی میتونین شکم ماهی را با باقی سبزیها درست کنین. نتیجه همچنان خوشمزه خواهد بود. ماهی را پاک کنید, پولک هایش را بگیرید و شکمش را خالی کنید. فر را روی درجه ٣٥٠ فارنهایت یا ١٧٥ سانتیگراد روشن کنید تا گرم شود, و ظرف فر را کمی چرب کنید. در یک تابه متوسط روی حرارت متوسط روغن را داغ کنید و پیاز را سرخ کنید, حدود ١٠ دقیقه. سیر له شده را اضافه کنید و برای یک دقیقه دیگر تفت دهید. سبزی ها را اضافه کنید و برای ٣ تا ٥ دقیقه تفت دهید تا آب آنها گرفته شود. زرشک, ٢ قاشق آب لیمو, رب انار, و گردو چرخ شده را اضافه کنید. دو دقیقه دیگر بپزید, نمک و فلفل بزنید و از روی حرارت بردارید. داخل و بیرون ماهی را نمک بزنید, و با مخلوط سبزی پر کنید. و شکم ماهی را بدوزید. روی ماهی را ٣ برش کوچک بدهید و درون فر برای ٢٥ تا ٣٠ دقیقه بپزید تا روی ماهی طلایی شود. ماهی را به ظرف مناسب منتقل کنید. کره را آب کنید و با زعفران آب کرده و آب لیمو مخلوط کنید و روی ماهی بریزید. ماهی را با سبزی و نارنج یا لیمو تزئین کنید. If anyone can prepare fish, it is the people of Mazandaran. No Nowruz table should be without fish as you have presented here. Sabzi polo va mahi! Very tasty recipe, thank you for sharing! ~ Fae. Leilee - this looks just beautiful. Thank you for sharing and the history behind it. This looks so delicious! 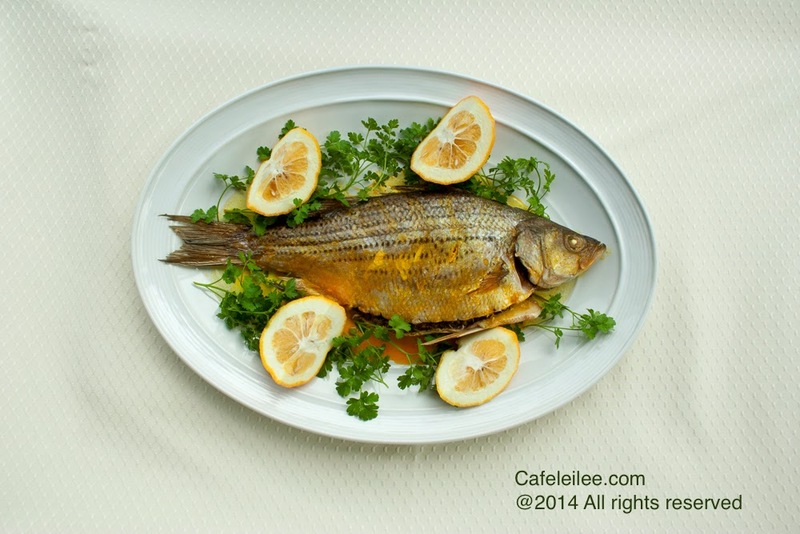 I love whole fish and this would be such a great alternative to the fried white fish we normally make for Nowruz! Leilee jan thank you for sharing this festive Nowruz regional dish. I'm fascinated by the herbs you list and will seek them out on my next trip to Iran. Thanks for the great recipe! Is 25-30 minutes long enough though? This a very good and tasty recipe. Your choice is amazing . I specially likes your all recipe which is shared by you. thanks for sharing.